Fifty years ago, Detroit exploded in an uprising which left 43 people dead, over 1,000 injured, and 800 businesses burned and looted. 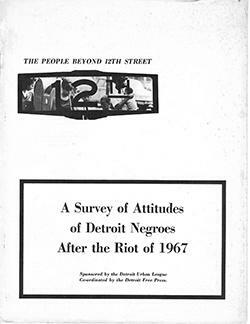 At the time, little was known about the people who participated in the uprising, so Philip Meyer of the Detroit Free Press convinced the then managing editor to team up with the Detroit Urban League and researchers at the Survey Research Center to conduct a survey of the black people living in the main riot areas of East and West Detroit. A column in the Detroit Free Press, A call to action after 1967 Detroit riot goes largely unheard (note: auto-playing video) discusses the results of that survey.